The sparkle in his eyes and energy in his voice revealed Marc Hanna’s love of telling the story. “Lamar Buffalo Ranch is like the Mount Sinai of the environmental movement,” he concluded, “we got the tablets here.” The group of writers and guides gathered around the table erupted in spontaneous applause. After a morning in Yellowstone’s Lamar Valley—“America’s Serengeti”—we were already enamored with everything. Our knowledgeable guides, peeks of sunshine, countless elk, eagles, coyotes, and herds of bison—visible as dark mounds through the swirl of a passing snow squall—all combined in a kaleidoscope of wonder. To top it off, we paused for lunch at Lamar Buffalo Ranch. These quaint, historic buildings gathered next to a large corral date back to a very different time in Yellowstone National Park—a time when the seeds of our current environmental ethics were just beginning to sprout. While bison survived the mass extinctions of other megafauna at the end of the Pleistocene, they fared much worse during the 1800s. Settlers, market hunting, sport hunting, and a U.S. Army campaign nearly eliminated these majestic creatures—once numbering more than 30 million—from our prairies. Even the creation of our first National Park, with security provided by the U.S. Army, couldn’t fully protect the remaining bison from poachers. The Army’s “snowshoe cavalry” built patrol cabins in the woods for their campaign against poachers. They skied between huts on large wooden planks, called “Norwegian snowshoes.” Four surviving remote cabins still provide housing for National Park Service (NPS) patrols and researchers. But in the end, an even more dramatic approach was needed to save the last of the bison. With just 23 free-ranging bison left in the park, the U.S. Army created a new herd in 1902, using pure-bred captive bison from ranches in Montana and Texas. The cabins and corral at Lamar Buffalo Ranch were built to protect the new herd, oversee their breeding, provide them with supplemental feeding in the winter, and eventually propagate more than 1,300 bison by 1954. According to Marc Hanna, this marked the first time in history that humans had hunted an animal to the brink of extinction, then taken a step back, desired the recovery of the species, and fully facilitated their captive breeding and release. That is why Marc called Buffalo Ranch the “Mount Sinai of the environmental movement.” The ethics and values embodied in these old buildings still propel our conservation efforts today. Just up the hill behind the corral, in a thick stand of trees, lie the remains of one of the wolf release pens from their reintroduction just twenty years ago. The Army’s campaign to save the bison was surely a precursor to the wolf recovery effort. Today, wolves and bison rival each other for the title of most iconic species in Yellowstone. What if neither had survived? The ripples don’t stop there. A thousand miles from Yellowstone, but just down the road from my house in northern Wisconsin, there are reintroduced populations of American martens and elk. Perhaps, according to Marc at least, any modern effort to protect, increase, or release a floundering species can be tied back to the small herd of bison once cared for by the Army. With such an illustrious history in the active stewardship of Yellowstone, it is fitting that these buildings still have a role in inspiring conservation. After the addition of old tourist cabins in the 1980s, and a remodeling project in 1993, Lamar Buffalo Ranch became a residential learning center. Middle school students stay in the cozy cabins during their “Expedition: Yellowstone!” educational program put on by the NPS. A dozen or so students worked in a variety of media as Eleanor opened her personal field journals for us. Vibrant colors of dried grasses, willows, and wildlife shone from the pages, and herds of bison rumbled through the rainbows, too. The beauty she captured was soul-grabbing, and would inspire anyone toward conservation. The legacy of Buffalo Ranch continues. Marc is the campus manager for these Field Seminars, and plainly loves connecting visitors to this amazing landscape and the stories it has to share. He does a great job too; better than I can do from the outside. Maybe you should go visit, and let him tell you the story. The impacts of bison and their recovery make tracks all over the west, our collective psyche, and the ski trails in Yellowstone. Photo by Emily Stone. The first coyote we saw was dead. A stain of fur and blood, smeared onto the roadside, it was attended by a vivid flock of magpies. “Days-old road kill,” murmured Carolyn Harwood, the Yellowstone Association naturalist. We had stopped to look at three moose, who promptly disappeared into a willow thicket. Then a dipper caught our eye. The slate gray, aquatic songbird dove through the inky waters of the Lamar River, then bobbed onto an ice shelf with an insect in its beak. Two eagles presided regally over the scene from their high perches in gnarled trees. The second coyote we saw was alive – standing on the far bank of the river, its bushy tail and slight build silhouetted against the snow. These song dogs (a nickname earned through their frequent, yipping howls) have had an interesting history in Yellowstone National Park, and across the country. Although they were persecuted – trapped, poisoned, shot – just like most western predators, they were able to survive and multiply, expanding their range into Alaska, Central America, east to Nova Scotia, and into farmland, cities, and suburbs. Coyotes’ success is partly due to their adaptability. Their wide-ranging diet includes mice, voles, rabbits, elk, pronghorns, and even carrion, insects, and trash. Having escaped the predator elimination efforts, coyotes were handed a habitat free of their main predators – wolves. By the 1920’s, wolves were extirpated from most of the United States, including Yellowstone. Only Alaska and northern Minnesota retained a continuous population of Canis lupus. In the absence of wolves, coyotes changed their behavior to fill the niche of an apex predator. By living in larger packs than usual – up to seven coyotes in a family group – with the same alpha-led structure as wolves, coyotes could take down larger prey. Their population increased more. The coyote on the riverbank turned and trotted into the willows. Barely noticing its departure, we scanned the floodplain and surrounding hills with binoculars, spotting scopes, and squinted eyes. The mid-sized canid was a nice find, but not our target for the day. That was the wolf. With wild grace, fierce skills, an unrepenting appetite, and the charm of a comeback kid, wolves were the quarry that ignited our imaginations and fueled our quest. Almost exactly twenty years after the wolves’ return to Yellowstone, Carolyn pointed out a patch of dense mixed forest on a side slope in the Lamar Valley, where the remains of their 1995 release pen still stands. The reintroduction of wolves into the Yellowstone ecosystem was not a lightly-made decision or an easy task. It was not without controversy, and certainly, no one asked the coyotes. In the first year of the wolves’ return, they killed at least 12 coyotes in the Lamar Valley. Harassment continued, and the coyote population on the northern range (where wolves were reintroduced) decreased by 50 percent. Not only were the wolves and coyotes competing for some of the same food sources and territories, but wolves actively attacked coyotes that crossed their paths, and destroyed dozens of coyote pups near the dens. Unfailing in their adaptability, coyotes quickly relearned how to live in a wolf-dominated landscape. With a decrease in pack size, increase in wariness, and return to smaller prey, their numbers may once again be on the increase. Wolves impact much more than just coyotes, though. According to the Park Service, wolves’ predation on elk calves and adults has contributed to the herd size being cut by over 50 percent – to a much more manageable size for the habitat. The elk’s behavior changed, too, since they were easy targets in the brushy willow valleys where they liked to browse. This allowed willow and aspen saplings to survive, beavers to increase, and overall habitat to improve. In addition, wolf-killed elk carcasses feed an incredible array of scavengers. Ravens, magpies, bald eagles, and golden eagles have all benefitted since the wolves’ return. Grizzly bears often usurp wolf kills, too. Despite our best efforts, we spotted no wolves on the northern range. Still holding onto a glimmer of hope, we waved goodbye to our little Yellowstone Association tour bus and climbed into a tracked snowcoach for a ride into the center of the park, and the elegant Old Faithful Snow Lodge. Not far beyond the Mammoth Hot Springs, our driver, Kristi, spotted a red fox hunting in a snowy meadow. Oblivious to its audience, the fox stalked – ears craning forward – then froze, and finally leapt up and pounced down through the snow. While that fox came up empty-pawed in the meadow, it has profited substantially from the return of wolves. Just as wolves compete with and kill coyotes, coyotes compete with and kill foxes. Wolves’ and foxes’ diets barely overlap, though, and they are much more tolerant of each other. So as the wolves increase and coyotes decrease, foxes increase, too. While the fox pounced again (and again), the snowcoach rumbled on. Past wooly bison, rare plants, steaming valleys, obsidian-flecked hillsides, river gorges, waterfalls, and countless breathtaking views, we drove deeper into the park. As dusk crept in, I began to go glassy-eyed with fatigue and the overwhelming splendor of the day. Then, with an almost audible click, my eyes locked with his. The wolf stood ankle deep in the Fire Hole River. He shook water from his coat in a flash of movement that woke me up. “Stop! Wolf!” I cried out, startling the whole crew out of our reveries. From the cover of our snowcoach, we watched him feed on the bony carcass of an elk, pull chucks of meat out of the river, and pee on the snow. Rapt in his wildness, astounded by our luck, we watched the light fade on our “three dog day.” Just another taste of the magic of Yellowstone. Columns of steam rose from the valley behind a curtain of dark green trees as we pulled up to the trailhead. Five chatting friends tumbled out of the bright yellow Bombardier snowcoach into still morning air. With the satisfying “click” of boots locking into skis, and a few words about technique, we took off down the old road-turned-ski trail. From the start I was distracted by tracks. The huge hind feet of snowshoe hares were like exclamation points dotted by their tiny front feet. “SNOW!! !” They seem to shout, and we joined in their enthusiasm. Pine martens had sewn dotted lines over the drifts in their typical stitch of paired tracks at an angle to their direction of travel. Red squirrel tracks visited each tree like a connect-the-dots coloring page. Across the sparkling Fire Hole River, an otter slide nicked the bank. All of these familiar friends made me feel at home. Then, a large, messy trough of tracks entered from the woods, and started post-holing down the center of the groomed skate lane. Too round to be boots, too big to be deer, these tracks were from bison. I don’t see that back home! Here in Yellowstone National Park, though, bison are more common than deer in the winter, and the tracks of elk and wolves commonly pock the ski trails as well. While the animal signs were fun to see, they weren’t our goal for the day. At the end of this trail sits the Lone Star Geyser. Named for its remote location – three miles from its nearest neighbor (Old Faithful itself) – this is one of the biggest geysers in the park. Its large cone, formed slowly by silica that precipitates out of the water, chronicles a very long life. Since at least 1872, Lone Star Geyser has been erupting approximately every three hours. It begins with a heat source – shallow magma chambers left over from one of the largest volcanic eruptions known to have occurred in the world. Then water – rain and snow – seeps into cracks, fissures and cavities in the rock above the magma chamber. As the heated water begins to rise again, it may pool in an underground reservoir capped by a constriction. Minerals from the water precipitate onto the walls, making them pressure-tight. This narrow tube of resistant rock keeps the water from rising freely, as it does in the many hot springs in Yellowstone. Water nearest the surface does cool down, but it can’t circulate in the tight quarters. Instead, it pressurizes the water below it like the lid on a pressure cooker. Higher pressure means that the water in the chamber can heat to above the normal boiling point. But it can’t heat indefinitely. The water nearest the magma eventually starts to steam, and the resulting bubbles burst through the geyser’s vent, carrying splashes of water with it. This reduces the pressure in the whole system. The superheated water flash boils into a column of steam, and erupts in a spectacular display of hydrogeology. As we milled around the viewing area, taking photos, shooting video, and just being amazed, some tentative sunshine broke through the clouds. In the steam cloud, a rainbow appeared, and we couldn’t believe our luck. We skied back with soaring hearts and full memory cards. The thick forests we skied through, with their plentiful wildlife and beauty, are all protected because of what we just witnessed. Yellowstone has the world’s largest and most diverse array of geysers, hot springs, mud pots and steam vents. It was these features that prompted the creation of the world’s first national park on March 1, 1872, and eventually led to the creation of the National Park Service in 1916. While the animals we saw on the trip weren’t the goal of the park, they have benefitted dramatically from its protection. Bison, wolves, cougars, and more would not be here in this healthy ecosystem if it weren’t for our fascination with the geysers. In my mind, that makes the eerie views of steaming valleys even more magical. Great day to ski: The wide, flat road along the Fire Hole River makes a great place to ski and chat with friends! The Lone Star Geyser only erupts every three hours, and the sun only came out one that day. We were very lucky to see a rainbow in the steam! Photo by Emily Stone. “Piggy back, please!” squealed Kylee, my five-year-old niece. Because she is adorable, and I don’t get to see her very often, and she only weighs thirty-eight pounds, I squatted down to let her climb on for about the fiftieth time that day. Only Auntie Em is such a pushover. So with the little monkey on my back, we galloped through mowed paths of my parents’ restored prairie in northeast Iowa. Down to the old barn, past the woodpile, and then back toward the old apple tree. “Whoa, check that out!” I said as we rounded the side of the tree and noticed that the trunk was only half there. From ground level up to about Kylee’s chin, the tree was only a partial cylinder of wood with a hollow center. Kylee slid to the ground and we both stuck our heads inside the cavity to look around. Blue sky peeked through two holes higher up in the trunk. I circled around to look down in, and by positioning myself at just the right angle, Kylee and I could see each other through the tree, her looking up and me looking down. We giggled. “Is it still alive?” Kylee asked. “Yes, it is,” I replied, “and isn’t that amazing?” This old apple tree still produces a bumper crop of the tastiest apples every few years. Since the tree was already here, and already hollow, when my parents bought the land in 1979, we have no idea what variety of apples they are, or when it became hollow. Just by the shape of the tree – its straight bottom and leaning crown – I might guess that it was a double-trunked tree that split, or perhaps had a large lower limb that peeled off in its middle age. Once an injury like that opens up, bacteria, fungi, and invertebrates move in to the heartwood and slowly decompose it away. The heartwood is already dead, so all the tree loses is a little bit of structural stability. All of the growth and water transport continues in the outer shell of the tree–the sapwood–even as the center of the tree rots away. Xylem cells in the sapwood transport water and minerals up from the roots to the rest of the tree. Phloem cells transport sugars from the leaves to the roots, and into the growing apples. As new rings of sapwood grow on a tree, the innermost sapwood cells fill with resins and become heartwood. Losing one’s heartwood seems like a devastating prospect, but it actually brings new life to the forest. Tree cavities provide homes for scores of critters. Bluebirds, kestrels, wood ducks, raccoons, flying squirrels, gray squirrels, woodpeckers, owls, wrens, chickadees, bats, mice, porcupines, bears, invertebrates, playful kids, and many more of our neighbors find shelter in the cozy space of a hollow tree. In order for a tree to become hollow, though, it must start the process while it is still alive. Trees that are not already hollow will not become hollow after they are dead. It is the contrast between living sapwood and dead heartwood that sets the stage for a great hidey-hole. Cavity trees must get their start early in the life of the forest, and have plenty of time to develop. They are a rare and valuable resource. This hollow old apple tree, with its unique flavors and incredible longevity, is highly regarded among our family. We’ve grafted its twigs onto two little baby apple trees to try and perpetuate its legacy into the future. We’ve canned and dried its fruits to feed us through the winter. I’m sure that it’s housed a few families of rascally raccoons. And today it inspired wonder and giggles in two little girls. I’d say that it still has plenty of heart. 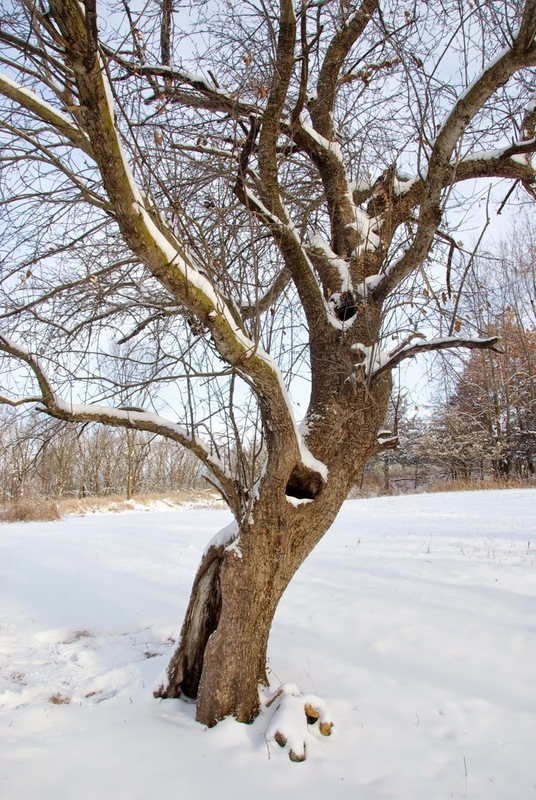 This old apple tree has a hollow core, but plenty of heart. Photo by Larry Stone. Just a few minutes up the trail after seeing the hairy woodpecker, we again heard a tapping noise through the fog and sleet. Like déjà vu, a black-and-white checkered woodpecker clung to a birch tree, using its chisel beak and kickstand tail to look for bugs along the knobby twigs. Only this time, there was no red on its head, the overall size was smaller, and her beak was tiny. Here was a downy woodpecker, the smaller cousin of the hairy woodpecker we had just seen. Telling apart these two black-and-white woodpeckers is one of the rites of passage for beginning birders. My dad initiated me early, with this simple comparison: when you see a hairy woodpecker, you think “What a beak!” because it is so large (as long as the head). When you see a downy woodpecker, on the other hand, you might ask yourself “What beak?” because it is so tiny and inconspicuous. To go with their smaller beaks, downy woodpeckers are only two-thirds the size of a hairy, and weigh only one third as much. This size difference has a big impact on the places that each woodpecker can forage, and allows them to exploit almost exactly the same range and habitats without too much direct competition for resources. For example, the featherlight downy (who weighs under an ounce) gleans insects from bark crevices on smaller branches, and will often be seen dangling acrobatically on twigs like a chickadee. Meanwhile, the heavier hairy woodpeckers dig for wood-boring insects on trunks and large limbs that won’t swing under their weight. Hairy woodpeckers also specialize by following pileated woodpeckers. After a pileated excavates a large hole and moves on, a hairy might clean up the crumbs of insects that the pileated missed. Hairy woodpeckers have also been seen drilling sap wells into sugar cane, and nabbing sap from wells made by yellow-bellied sapsuckers. Downy woodpeckers have their own set of special feeding habits. Their small body and sharp beak make it easy for them to cling to the dried stalk of a goldenrod plant and drill precisely into a gall on the stem. Inside, they might find a sweet, juicy gall fly larvae for dinner. Downies compete with chickadees for this food source. If you find a bird-eaten gall, you can guess at the culprit by the neatness of the hole. Chickadees have much blunter beaks and excavate a messy, wide-angled hole. When downy woodpeckers forage on trunks, as the females are more likely to do in the winter, they are better able to move horizontally and downward. This might give them a different angle on the bark crevices, and a better view of food that larger species missed. Angles are important for their nest sites, too. Hairy and downy woodpeckers both choose a trunk or branch that is leaning to one side, and chisel the nest entrance into the underside. Scientists hypothesize that this keeps flying squirrels or sapsuckers from moving in. Both hairies and downies prefer excavating their nest holes in a living tree with a rotted core, or a soft dead tree, although the downy can use smaller trees and limbs. The slight but important differences between hairy and downy woodpeckers that allow them to share a forest without pushing each other out are a function of their ecological niches. In shorthand, we sometimes define “niche” as “how an organism makes a living.” More technically, a niche can be defined as “the sum of the habitat requirements (including both the living and non-living elements of the environment) that allow a species to persist and produce offspring.” A niche also includes the ways that an organism responds to the distribution of resources, and to competition from other species. All species have a niche. As we hiked across a snowmobile trail on the way back to our car, it struck me that human adventurers fulfill more than just one niche, too. With trails for skiing, skijoring, snowmobiling, hiking, and fat biking winding through our forests, everyone can get out and enjoy the woods in their own favorite way. What will you do? If snowshoeing fits your niche, then join me on a snowshoe and tracking adventure this winter! Find the dates, descriptions, and registration instructions at www.cablemuseum.org.